Going abroad often presents a cascade of practical issues to the traveller, from visa requirements to currency differences, bank account problems, to insurance. However, in the last twenty years, at least within the borders of the European Union, a number of administrative and bureaucratic changes have made travelling the continent a much less daunting task. For Kraków at least, as part of Poland (which joined the EU in 2004), those changes have helped usher in a period of healthy tourism; where whether it’s a weekend break, a backpacking stop over, or a move for good, travelling has become a generally smoother and easier task here. Still, for the prospective traveller to Poland, there are still a few things worth bearing in mind. For example, while Poland is on the waiting list to join the single currency, it’s still not part of the Eurozone. Instead, like with most things in the city of Kraków itself, the legacy of Poland’s medieval past lingers on; the currency of Poland is still the Złoty, which dates right back to the 14th century. 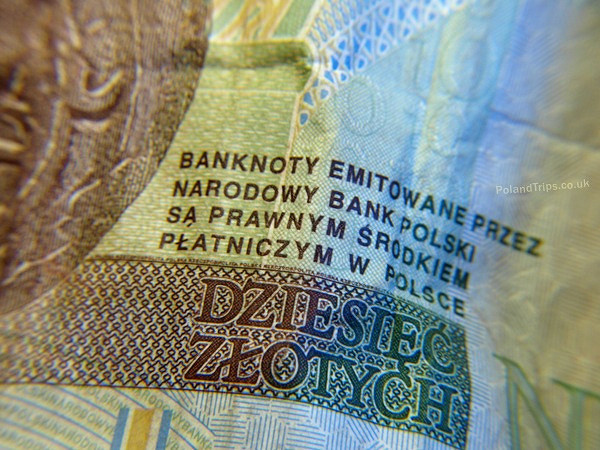 There’s really nothing daunting about using the Złoty. Conversion rates are easy to follow (especially for a Brit, because 5 Zł is almost exactly £1), the note denominations are logical, they’re colour coded, and the coins are clearly marked, making by far the most difficult aspect of Poland’s currency for a foreigner, it’s pronunciation: say Zwoti, not Zloty! Always try to keep an eye on your change in Poland, because the chances are every beer or plate of pierogi you buy will leave you with a few clinking coins, and the weight can build up. It’s worth remembering that 5 Zł actually goes quite a way in Kraków, and can buy you a beer, or two tram tickets, so try to use the coins when you can, even if to avoid giving bartenders high note denominations, and an excuse to give you that notorious tourist frown. In Kraków, cash points are everywhere and most accept all mainstream card types. Exchange booths are everywhere too, but it’s a good idea to avoid the ones around the train station and in the Old Town, as they have been known to scam tourists with dodgy buy and sell figures. For people who intend to stay longer in Kraków, it’s a good idea to apply for travel orientated bank cards which don’t charge fees for ATM withdrawals or point of sale transactions. Companies like Travelex now offer very reasonable exchange rates on their travel cards, which can be topped up from UK bank accounts and then used abroad for free. What’s more they have also developed online international bank transfer accounts, to let people staying in Poland for extended periods pay directly into Polish bank accounts (particularly helpful with rent and bill payments). It’s also very easy to set up a Polish bank account, and there are loads of national and international banks to choose from. In Kraków, the most popular is Alior, but most cater for English speakers very well, and offer fully functional internet banking. If you intend to stay in Poland a while, and especially if you want to work, getting a bank account, while not totally necessary, is probably still a good idea. For mobiles, contracts are easily available from most of the outlets in Galeria Krakowska, but pay as you go tends to be the popular option, and still very cheap.